Lynsi Snider has been president of In-N-Out since 2010 and inherited 100% of the family-owned business in 2017. In-N-Out ranks No. 4 on Glassdoor's 2018 best places to work list, which is based on employee reviews, beating out tech giants like Google and Microsoft. In-N-Out is the only restaurant chain in the top 50 companies on Glassdoor's list. To earn a top spot, Snyder said she listens to her employees, trains managers with flexibility, and provides fun perks that keep associates happy. Move over Burger King. There is new fast food royalty in town. Lynsi Snyder, president and sole heiress to In-N-Out, has molded the fast-food chain into one of the best places to work in the US. Employees said they love the chain and considered it the best restaurant to work for, thanks in large part to Snyder's initiatives and leadership. She even received a 97% approval rating from her employees on Glassdoor. On Glassdoor's 2018 best places to work list, In-N-Out ranked fourth, just behind Facebook, Bain & Company, and Boston Consulting Group. 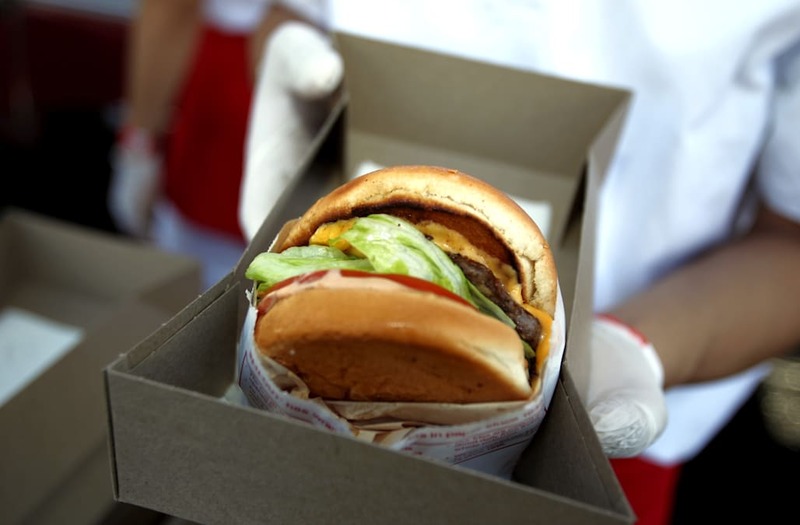 The list marks In-N-Out's fourth consecutive and fifth overall appearance. Despite serving as the president of one of America's favorite fast-food chains, which has 324 restaurants in six states and was valued at $1.1 billion in 2013, Snyder is noticeably private. But in an exclusive interview with Glassdoor, Snyder shared how she helped turn In-N-Out into one of the best workplaces out there. "Listening to our associates is a serious priority for me," Snyder said. "My hope is that anyone who spends time as an In-N-Out associate finds the experience valuable — an opportunity to learn and grow, and to have fun." In-N-Out satisfies employees with good pay and flexible scheduling. According to Glassdoor data, associates at In-N-Out earn, on average, $12.27 an hour, whereas McDonald's crew members earn, on average, $8.87 an hour and Burger King crew members earn, on average, $8.25 an hour. But Snyder said it takes more than pay and perks to show employees you are personally invested in them. "We spend a lot of time doing activities together — we have annual trips, we play sports, and every year we have several trips to my Dad’s ranch, sometimes for workshops and play, sometimes just for In-N-Out family time," Snyder said. "They are the reason for our success, and they deserve to enjoy coming to work, to feel appreciated, and to be treated like family, which is what I consider them," Snyder said of her employees. Snyder said that In-N-Out's work culture is so positive because of the employees. "The associates actually create that themselves by being so upbeat and enthusiastic," she said. That's why she's so deliberate about hiring the right people, as well as giving them opportunities to grow within the company. Snyder said many of In-N-Out's managers started at entry-level positions for the company. While training employees for leadership roles, the CEO said she focuses on flexibility. "This is also good for our culture, but it means there is no shortcut to growing great leaders through training," Snyder said. "Aside from that, our associates have told us that when they are growing and learning new things, they are more engaged in their job." Snyder said she doesn't have to talk publicly often to be a great leader — instead, she said she strives to communicate her positive message to employees internally.